Pookie and I are literally at a horse show living it up in the horse trailer/living quarters ( basically we are camping but I'd rather say we are glamping). Pookie turns 19 this Sunday and she has always wanted to be at a horse show on her birthday and this year we are making that happen. 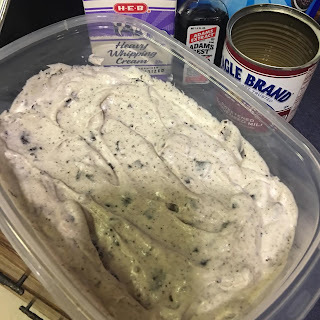 She also wanted Mom to make Cookies and Cream No Churn Ice Cream for her birthday dessert. Now let me say there is very little room in our living quarters part of the horse trailer and if I can make this ice cream in here you can make it anywhere! Its usually a family favorite when we are at the lake ( the salted caramel seems to be the big hit there). Any whooooooo lets get to it. Crushed up Oreo's ( I get the bag above of the mini Oreo's because its the right amount and you can crush them in the bag. The amount of Oreo's is up to you, how intense of a cookie taste do you want. My family wants the whole bag! Blender or Mixer its up to you, I think using my Kitchen Ninja makes it easy peasy (any blender will do). 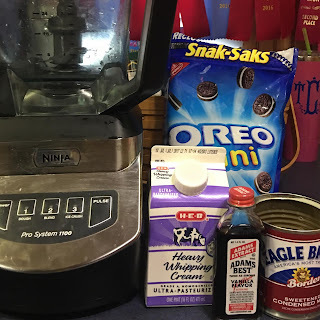 I add the Heavy Whipping Cream ( all 16 ounces ) into blender and whip it up. I blend till its nice and fluffy not to long. Then empty the whole 14 ounce can of Eagle Brand Milk ( sweetened condensed milk) into the blender with the heavy whipping cream and the 2 teaspoons of vanilla. Blend it up till well blended and fluffy, toss in crushed up cookies, mix a bit and pour into a container. I tend to use ones pictured below, they have a lid and I usually make a few flavors so the containers stack well. Put in freezer, I usually make the day before. It doesn't look all that special, but trust us IT IS GOOD. The other favorite over here is Salted Caramel. 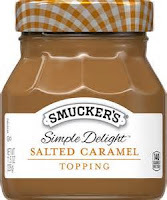 I get the Smucker's Brand Salted Caramel Topping in a jar, the picture is the exact one I use and is usually with the ice cream cones at the grocery store. I add half of the jar to the basic recipe and then pour into container and before freezing I drizzle almost all of the remaining caramel on top and then freeze. Sorry for the crummy pictures but again we are literally at a horse show and I told you all on snapchat I would throw it up on my blog. Let me know if you try it, or maybe you all ready make a no churn ice cream and if so what is your families favorite flavor.